I’m not going to lie, folks: I’m not sorry to see this week go. It certainly wasn’t the worst week ever, but it was busy, I was (am) tired, and calling my running “mediocre” this week would be generous. This coming week is Homecoming week, so it will be busy, too, but not quite as busy as last. Between meetings, games, and supervising the building of Homecoming parade floats, there was one night this week that I was home before 8:30. Since I get to work at 7, that made for some long days. 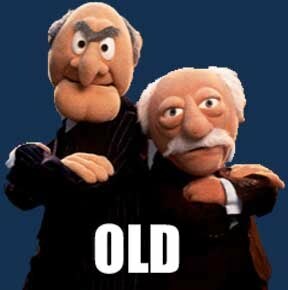 Also, I’m old. I had 12-13-hour days all the time in college, and I do not remember them wearing me out like this. Tuesday: AM: 35 minutes strength training PM: My training schedule said “fartleks.” My legs said, “No way.” So I ran 7 miles easy. My digestive system decided that since the legs didn’t have to work hard, neither did it, and it threw a fit. My stomach is a two-year-old. Awesome. Wednesday: 11 miles with 10 at marathon goal pace. I was still tired but definitely glad I took Tuesday easy. Thursday: 8-mile fartlek run…how my legs felt better the morning after a hard workout than after a rest day, I do not know. It was still harder than it really should have been, but possible. Friday: 7 slow, miserable miles followed by 25ish minutes of wimpy, lackadaisical strength training. I was not feeling the whole “exercising” thing on Friday. Saturday: 8 miles easy. It was cold and windy, but this was one of the best runs I had all week. I loved it. Totals: 58 miles running, 1 hourish strength. Instead of dwelling on the not-so-awesome parts of the week, I’m trying to focus on the good. Like the fact that I ran more miles (even if a lot of them flat sucked) during my first week of taper than during the peak of training for this same race two years ago, when I set my PR. And now I’ve got two weeks of serious tapering until the race! This was actually last Sunday, but whatever. And it’s blurry because I was trying to be sneaky. Here’s the story: I love to have my house decorated for the seasons, and I love silk flowers. I have two big vases and several small ones that I like to change out each season. However, my lack of artistic talent makes this a major (and majorly frustrating) task for me. So my amazing husband, who is much more artistically blessed than I am but couldn’t care less if there were flowers in his house, put out all my fall flowers. They look fantastic. I am so lucky. 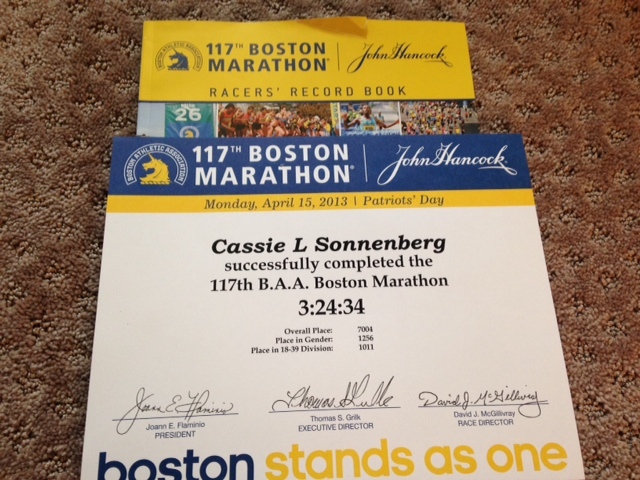 My Boston finisher stuff finally came yesterday. It made me happy and sad all at once. Now that I’m feeling better about life, let me set some goals for the upcoming week. Target Practice is a weekly goal-setting post. I stole the idea from Fit. Fun. Femme. Speaking of Fit.Fun.Femme, Sara, who blogs over there, ran a PR half marathon this weekend. She’s a rockstar. Congrats, Sara!!! Life: Have a better attitude than last week. I had quite a number of grumpy days. Yes, I was busy. Yes, I was tired. No, I did not need to let that make me snippy with my husband or my students. I will be less of a grump this week. Even if everyone (student-wise) is whining because I make them work during Homecoming week. Time to stop being Grumpy Cat, Cassie. Health: Get some good, solid rest this week. There were several days last week that by fifth period, I was just dragging. Which, of course, contributed to the grumpiness. Some more sleep–and some more down time before going to bed– should improve that issue. Fitness: It’s taper time, folks! Last week wasn’t a huge cutback; this week, my mileage will be somewhere in the 40s. So my goal is to run the easy miles easy, get my two days of strength work back in there, and do my usual 4-5 days of core work. I really slacked on core last week. How do you deal with crummy weeks? Tell me something cool you did this weekend. Even if it’s not as cool as skydiving. I think your week looks pretty darn good for being a mediocre week! Good work! I camped in the snow in Crested Butte this weekend. It was literally very cool–or freezing. You are so fast! Congrats on running that many miles last week! I think I would be dead. Enjoy your taper! I hope that this week is better for you. Enjoy your last week of taper, too! Can’t wait to hear about your race this weekend! Like Amy said, all I could think the whole time was, “Holy cow! She ran 58 miles and that was mediocre?” You never cease to amaze me with all of your workouts AND the work you do. Teachers are super human, I am pretty sure. I hope your Monday is great! Sister friend…you are such an inspiration! You rock it out every single week and maybe it wasn’t exactly what you were hoping for, but it was still amazing. 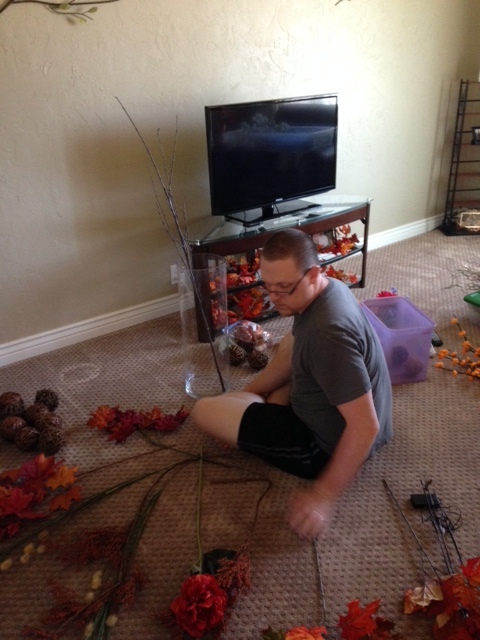 And how sweet of your husband to put your flower arrangement together – that’s love :). Sorry you had a rough week- but I love your attitude to make this one better! 🙂 Get lots of rest and treat yourself well during Taper! Thanks, Linn! I miss talking to you and the DIVAs. Can’t wait to hear about your marathon!